Here are a few photos of Jeremy Irons from his appearance in the upcoming episode of Law and Order: SVU titled “Mask.” The episode is set to air on Wednesday, 12 January 2011, at 10PM ET/9C on NBC. The photos were found on the All Things Law and Order Blog. 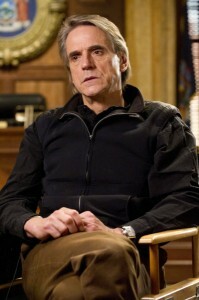 View more photos of Jeremy Irons on "Law and Order: SVU"